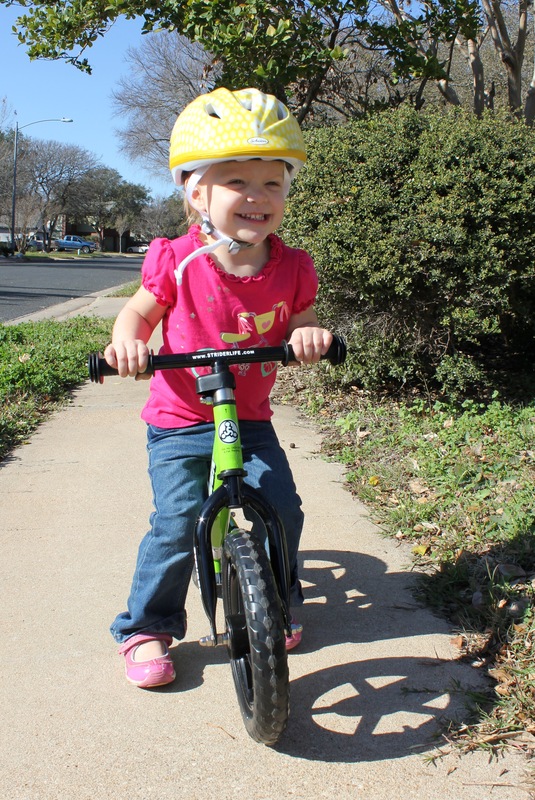 Balance bikes are a relatively new item. They are very small bicycles that can be used by kids as young as 18 months. They’re different because they have no training wheels and no pedals. The kid propels himself with his feet, then he learns that once he has enough momentum, he can pick his feet up, and suddenly he’s balancing on a bike. As young as two years old. When he has the coordination to pedal, he can move up to a “real” bike easily. 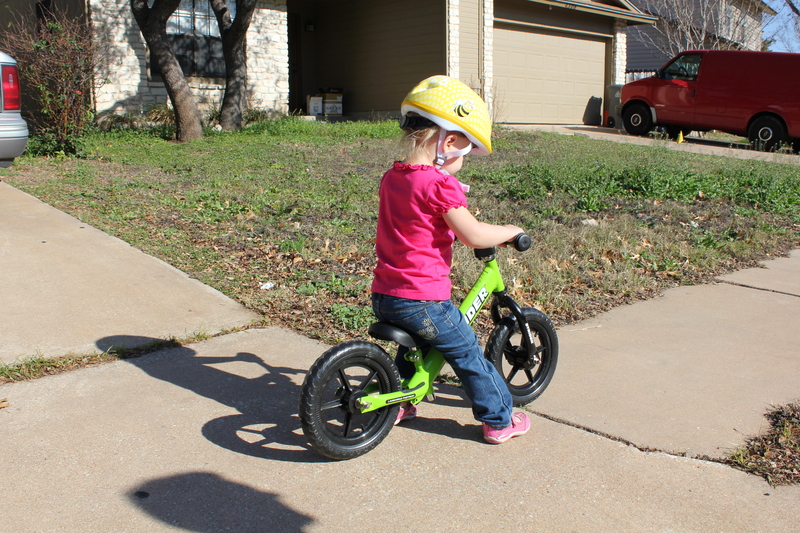 I have a lot of friends who got balance bikes for their kids (all happen to be boys), and they raved about them. Then Hannah got the bug. She is usually an easy shopper. She doesn’t have fits in stores and doesn’t even express a desire for anything that we see. Until recently. We found ourselves exiting REI with a toddler dramatically sobbing, “I need bicycle! I need bicycle!” (her Uncle Dave and Aunt Kris would be so proud). So after lots of research, we shelled out for the name brand, “Strider,” in a gender-neutral color on the justification that we’re hoping it will get many years of use. She is soooo happy. She kept saying, “Ride bicycle like big kids. I like it!” The helmet was also very exciting. She goes very slow right now, but I’m a little worried that I’ll have to take up jogging when she gets the hang of it. We’ll post video eventually, but our hard drive is being weird. To summarize: Hannah gets right on the bike and takes off, then she gets distracted by an airplane overhead, then she realizes the tires spin when you lay the bike on its side, then she rides some more. Life is fun. Whoa! You? Jogging?!? I guess it’s cheaper & better exercise than a Segway. Glad H likes her bike! Looks like fun! She is a big girl!!! I hope she has fun with it. Can’t wait to see the video. Alison got one when she was 2 and 2 years later still hasn’t figured out how to really use the thing. I have a feeling her brother will be teaching her soon. I’m glad Hannah likes it!